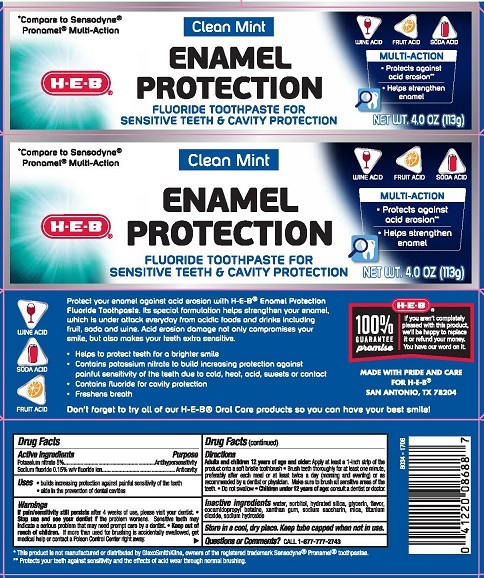 Proprietary Name: Heb Enamel Protection Multi Action What is the Proprietary Name? Heb Enamel Protection Multi Action with NDC 37808-336 is a a human over the counter drug product labeled by Heb. The generic name of Heb Enamel Protection Multi Action is potassium nitrate, sodium fluoride. The product's dosage form is paste, dentifrice and is administered via dental form. Stop use and see your dentist if the problem persists or worsens. Sensitive teeth may indicate a serious problem that may need prompt care by a dentist. Store in a cool dry place. Keep tube capped when not in use.